The Lensbright UV Headlight Restoration - Detailer Intro Starter Kit is an auto restoration starter kit that helps in restoring headlights. 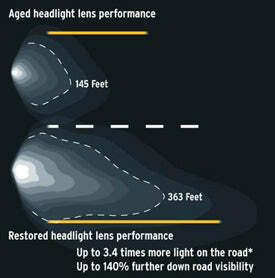 Plastic headlight lenses can deteriorate over a period of time when sunlight falls on them. Fogging and oxidation reduces the clarity of lenses and can have negative effects on the ability to emit light. The headlight restoration kit is an easy to use kit that makes restoring headlight easy and highly efficient. This simple value pack works to restore headlight clarity and along with it provides the long lasting UV protective clear coat. The kit comes with itself a handheld UV spotlight with UV-A lamp, Headlight Restorer Aerosol, Foaming Cleaner, sandpaper sheets, and safety glasses. While enhancing the look of your car, this DIY kit also improves night time visibility. This coating has withstood 3 years of Florida climate exposure with no deterioration.